Duquesne & Co L.P. presents us the Cognac Duquesne & Co L.P. Old Bottling , a cognac from France. According to Uvinum users, the Cognac Duquesne & Co L.P. Old Bottling deserves an evaluation of 3 of 5 points. 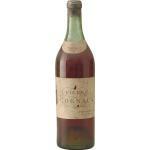 What are the opinions of other vintages or volumes of Cognac Duquesne & Co L.P. Old Bottling?